As a manufacturer of a food grade cleaner, we’ve spoken with a lot of organic food companies about cleaning— and we’ve noticed a common misunderstanding: that organic companies need organic certified cleaning products for their facilities, packaging, fleets and food processing areas in order to be organic compliant. In reality, a cleaning product only needs to be certified organic if, during regular use, it comes into direct contact with food or if it leaves a residue that could touch organic food. In other words, when cleaning organic food itself, an organic cleaner is needed. When cleaning everything else, the cleaner doesn’t need to be organic certified when used as directed and rinsed with potable water. Now, this isn’t to say food companies should use any old cleaner for their cleaning jobs that don’t include direct contact with food. 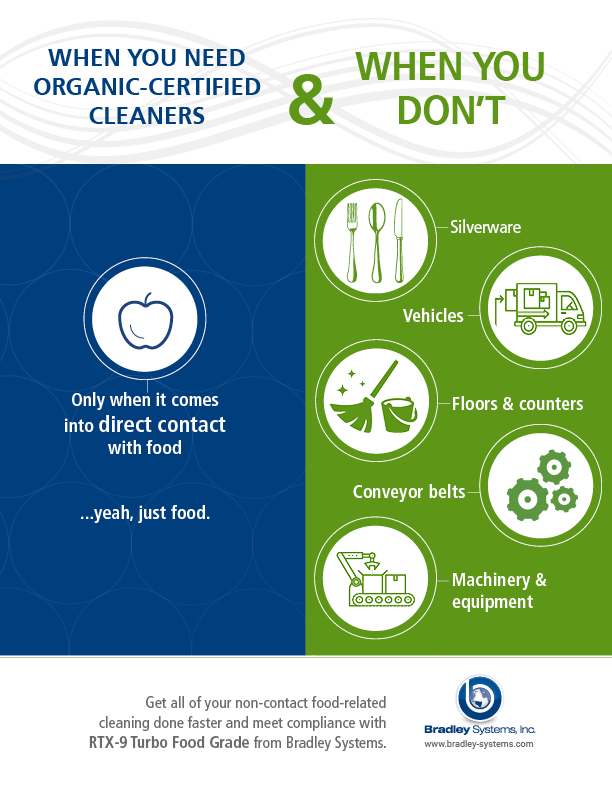 In fact, many of the leading industrial cleaners on the market contain dangerous chemicals, toxins and carcinogens that can create serious health risks if residue makes its way into food. Making things more confusing is the fact that even cleaners using general marketing terms like “green” and “safe” often contain hazardous chemicals. There are a few good ways to separate the food grade cleaners from the rest. The first is to look at the product safety data sheet to see what if any safety risks come with the ingredients. By law, health hazards have to be made available to consumers. The second way is to look at what if any food safety-related certifications or compliance the cleaner adheres to. If a cleaner is actually food grade, the manufacturer can prove this to customers by sending it to agencies that certify food-safe chemicals. For example, because we completed third party lab testing to ensure it is food-safe and free of health hazards, RTX-9 Turbo Food Grade is NSF registered and compliant with the Food Safety Modernization Act (FSMA) guidelines, California Clean Air Rule 1171 and the AIB. When used as directed, which includes rinsing with potable water, Bradley’s RTX-9 Turbo Food Grade can be used for everything from food transportation and storage units to conveyor belts and utensils. From organic bakeries to food processors and food-bearing fleets, Bradley’s customers can use Turbo Food Grade for a wide range of heavy duty cleaning applications without ever having to worry that their workers or organic compliance are at risk.